Happy Friday! I’ve been having trouble this week keeping track of what day it is, because the 4th of July fell in the middle of the week. Okay, I’ll be honest: every day has felt like Friday to me this summer. This blog is the only thing that is helping me to keep my days straight. And I'm certainly not complaining about that. Right now my mom is in town, so I’m going to keep this post short and sweet. She’ll only be here for a few days, so I want to enjoy them as much as I can. 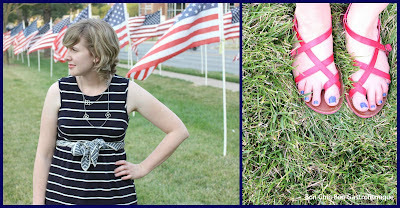 Today I’m linking up to Friday’s Fancies at Long Distance Loving, where the theme is “Stars and Stripes”. I thought this little area in my city would make a perfect background for the patriotic theme. These flags have been lining several of our streets for the past few weeks, and each one has someone’s name on it as a memorial. It’s the little things like that that make me love where I live; there are so many things that make it special.